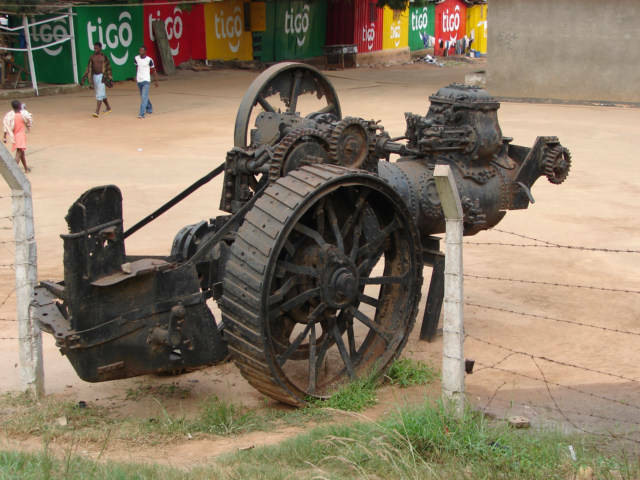 I saw about one Farm Tractor per month in Togo, I saw one along the road from Lome to Accra the other day here in Ghana. I saw many Car sales lots and one tractor there also. I now have seen what I think is my third Farm Tractor in Ghana. Cecil Rhodes around 1890 proposed that the best use of West Africa was for Farming, and over 100 years later it is still waiting to be used for cash crops, my guess is they use about 15 percent of tillable land. There is probably enough under used farmland in West Africa to feed all of Africa and most of Europe. Therefore, what does the world do to feed Africa; they send Food, when somehow it would make more sense to send Tractors. I suppose the world leaders know, the African leaders would probably just put them back on a boat and sell them to Asia, so what is the point. There is an idea, set up a tractor loaning volunteer agency, go and loan tractors to villages to take them from hoe farmers to producing enough money they can buy two cell phones and a motorcycle.